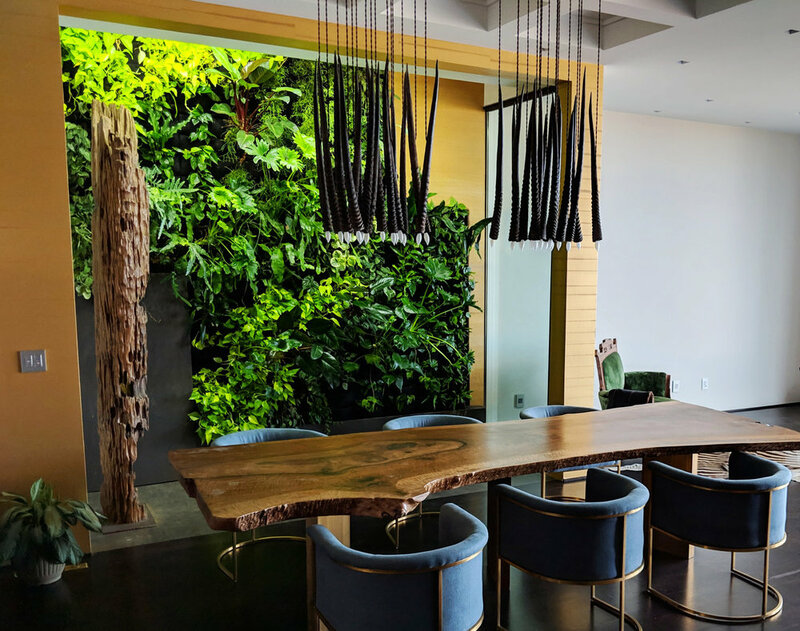 Northern California based garden design team Planted Places installs a beautiful poolside living wall installation for a client’s private home in Marin, California. An elegant collection of plants designed by Planted Places are planted in Florafelt Pocket Panels. To quickly and elegantly build the living wall installation they used Florafelt Pocket Panels that are mounted to a wooden fence. Horizontal redwood 2x4 lumber is first mounted to float the living wall away from the fence. The air space behind the panels ensures the fence remains dry. Wood Supports protect the fence from moisture buildup for this Florafelt Pockets living wall by Planted Places. Automatic irrigation is provided to keep the plants moist. Drip emitters are placed at the top of the Florafelt Pocket Panels with two drip emitters per pocket. Each dripper is positioned to the side edges. The goal with Florafelt Pockets is to irrigate the pockets, not each plant. Florafelt is designed to collect moisture at the bottom fold. Roots roots seek the moisture and grow into the felted system. Unlike typical planters, roots grow through and into the moist felt. This allows for plants to grow to full maturity, far greater than the small size of each pocket. Irrigation done right by Planted Places using the Florafelt Pocket Panel living wall system. Planted Places creates a beautiful mix of plants that create a cool and fresh design. For this project they worked with the owners who were involved in the actual planting of the project. Planted Places features a mix of grasses and succulents for this Florafelt Pocket Panel living wall. It’s more economical to start with smaller plants. The Florafelt Pockets are elegant enough on their own to highlight the new plantings and before long it will grow into a beautiful cacophony of life. Christine of Planted Places created this Florafelt living wall for their clients home in just an afternoon. 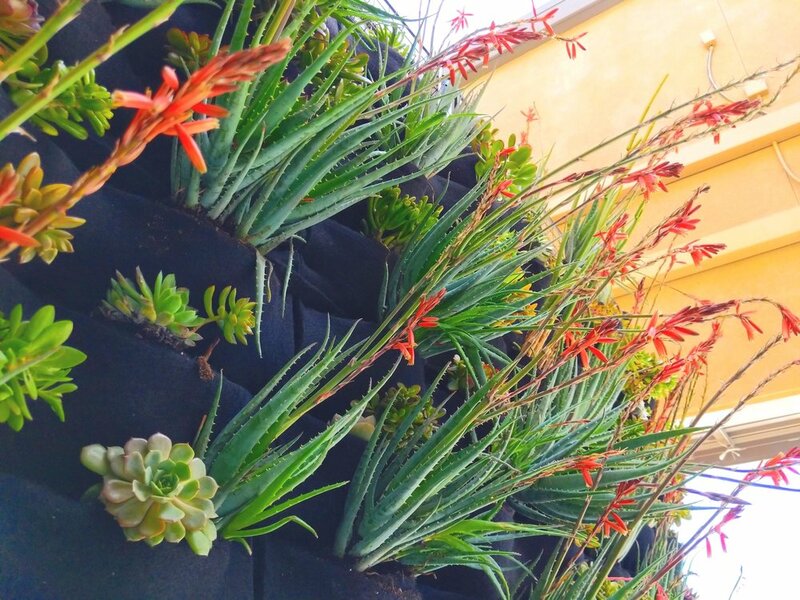 In a single afternoon, a beautiful wall of succulents dramatically transforms a retail entrance for Jamba Juice in Martinez, California, concealing an unsightly recycling area. Florafelt Pocket Panel living wall by Hannah Construction for Jamba Juice, Martinez. The team from Hannah Construction attaches the Florafelt Pocket Panel living wall system to an existing landscape screen. 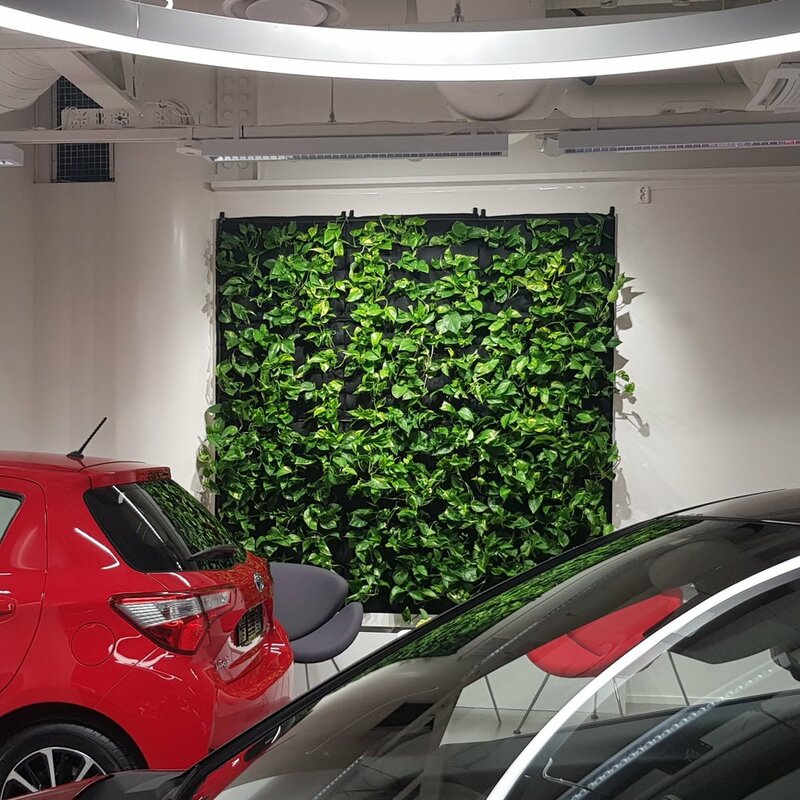 Florafelt Pocket Panels are attached to an existing Green Screen to create an instant real living wall. Featuring aloe, this beautiful mix of succulents will thrive in the bright indirect light of this open air entryway. Succulents are instantly beautiful in Florafelt Pockets and can simply be watered with a hose. In just a few hours, the entrance and outdoor seating area designed by Johnson Lyman Architects was revitalized into a welcoming spot for customers. 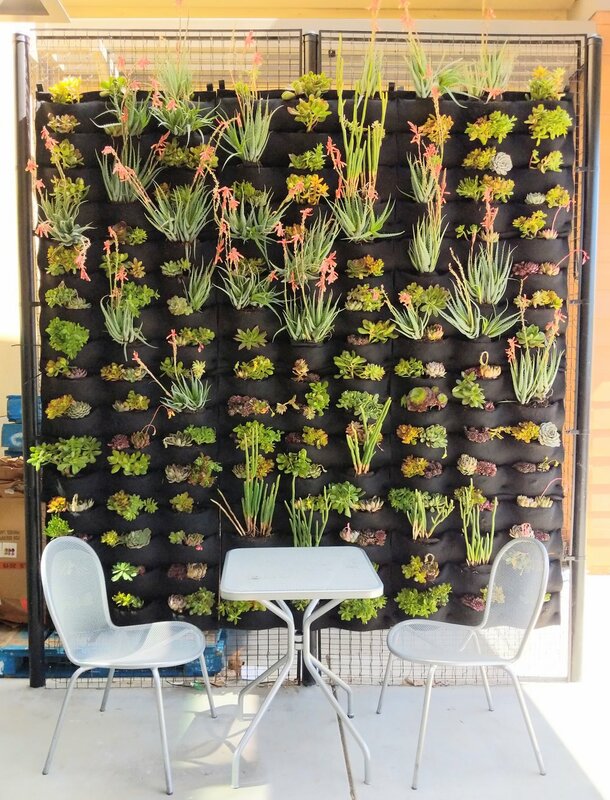 Florafelt Pocket Panel living wall filled with Succulents for Jamba Juice in Martinez, California. A wall of plants is more than a beautiful home feature. It’s an entire community of living things. Together they have a life of their own and create a distinct personality. The leaves grow and move every day, creating a subtle but distinct change. It’a living ecosystem that’s complex and rich, and that’s why they draw our attention. Landscape Designer Lindsey Graves of Living Green Design provides extra love and care to his living wall creations. Touching your plants lets you know your living wall better. You can feel the raw power of life in each leaf. Interacting with plants reminds of the miracle of living things. Getting to know your living wall will also make the plants healthier and happier. For example, wiping leaves removes dust so they can breath easier. The surface of leaves absorb carbon dioxide from our breath and converts it to oxygen, which helps us breathe easier too. Philodendron Congo Green loves bright light, and pairs nicely with Philodendron Xanadu Neon to provide striking color contrast. Plants bring huge joy. We love potted plants in our homes and offices, but it's magnified with an entire wall. 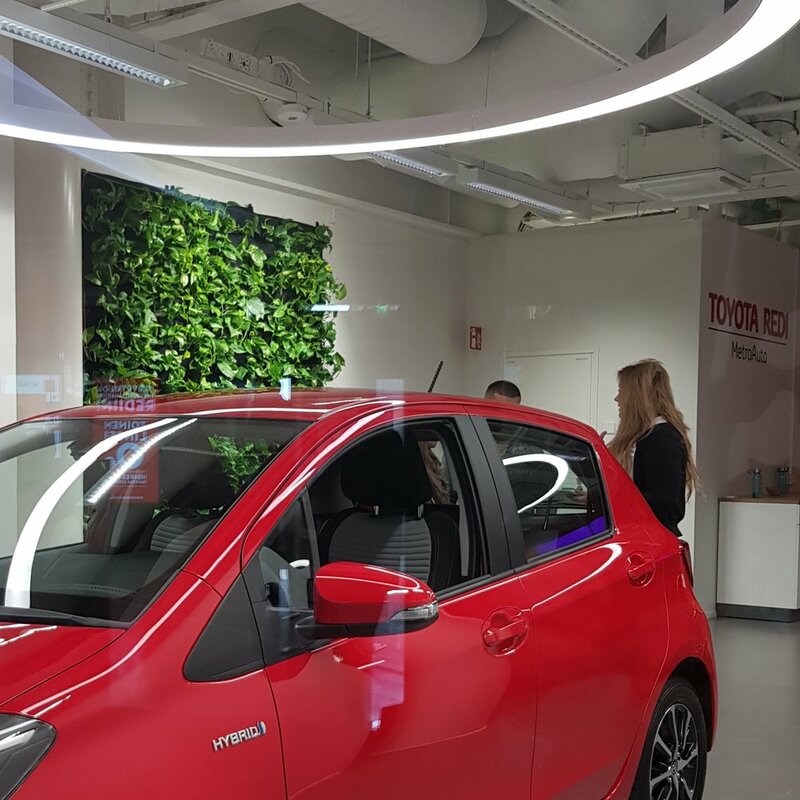 We spend most of our time indoors, so a vertical garden is a reminder of how important nature is for our well-being. It feels like an open window and lets us experience nature every day. Like a window into a jungled forrest this living wall was built into the design of this architectural home. This living wall is designed by the architect and owners of this Noe Valley San Francisco home. With their construction team, they created a waterproof alcove with floor drains. An inset plywood surface was waterproofed with rubber pond liner, and Florafelt Pockets were mounted using deck screws. Irrigation tubing was added at the top, and water slowly drips to each plant. Full-spectrum LED lighting provides perfect light levels. A mix of philodendrons and others are were added to create dramatic green sweeps with subtle textures. Over the years, the plants were rearranged, and new species introduced. The Florafelt Pockets and Wraps system makes it easy to sculpt this well-loved living wall. Affordable and elegantly designed synthetic felt pockets are mounted easily to walls. Once irrigation and drainage is in place they are quickly planted to provide you with an instant living experience. Florafelt Pockets Living Wall for Yoga Valo by Pasi Lindberg of Viherolo Oy Finland. Airbnb Coca-Cola Loft in Boston area features a Florafelt vertical garden for their guests. 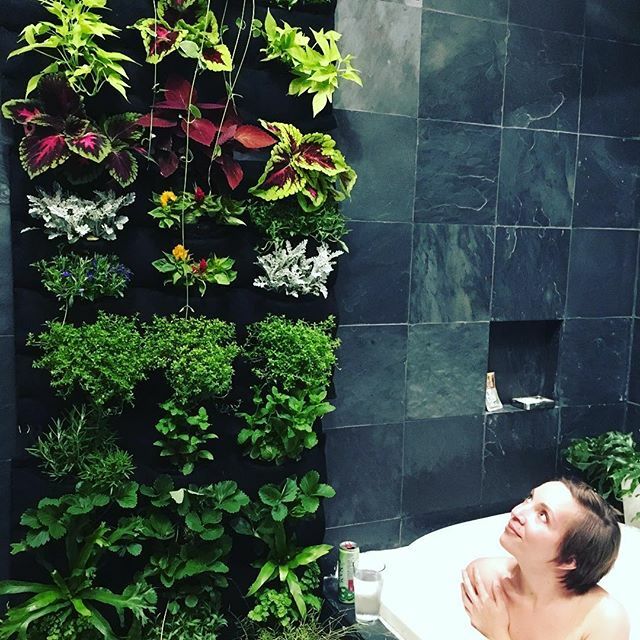 How fun to bathe beneath a beautiful plant wall. This Airbnb listing delivers. Next time you’re in the Boston area reserve and experience it for yourself.